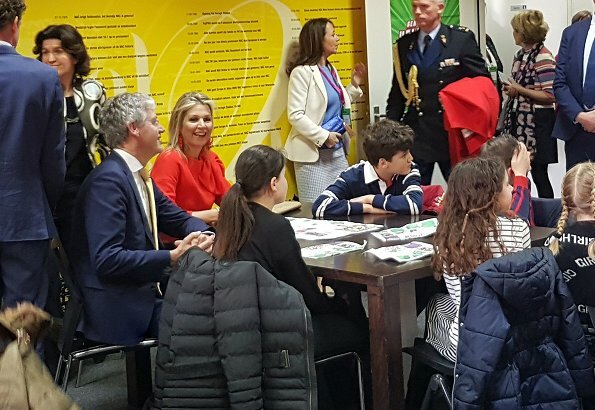 On the morning of March 25, Monday, Queen Maxima opened the 9th edition of "Global Money Week" at Rat Verlegh Stadion in Breda. 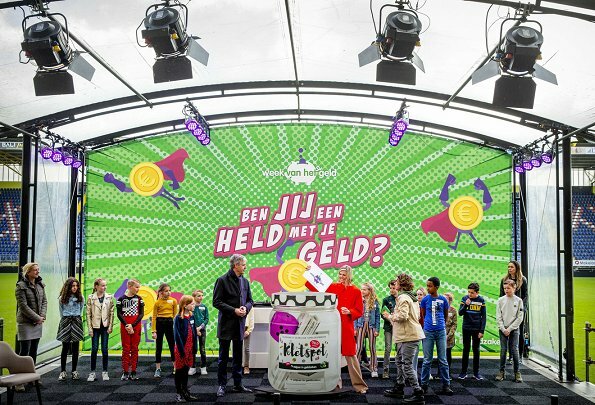 The Week of Money will take place on March 25-29 with the theme "‘Ben jij een held met je geld?". 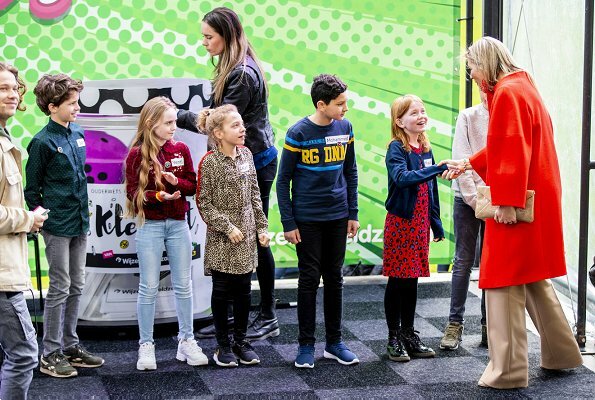 The Week of Money aims to help primary school students prepare for financial independence and international Global Money Week has a focus on youth and entrepreneurship. 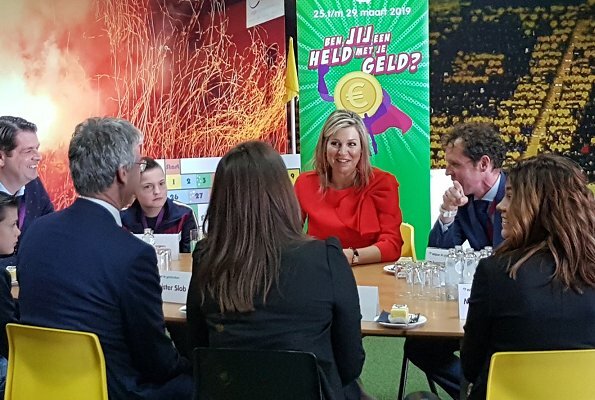 During the Week, partners of the Money Wise Platform organize activities for pupils to learn how to manage money. 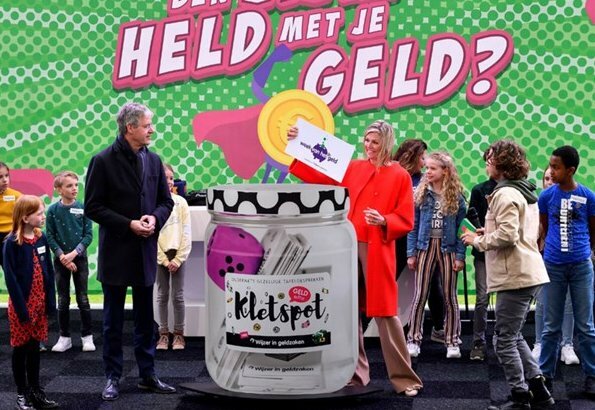 “Week van het Geld” is an initiative of the Dutch platform ‘Wijzer in Geldzaken’ (The Money Wise Platform). 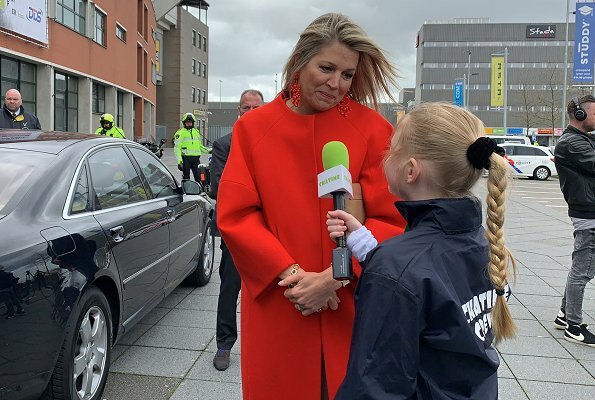 Queen Maxima is the honorary president of The Money Wise Platform. 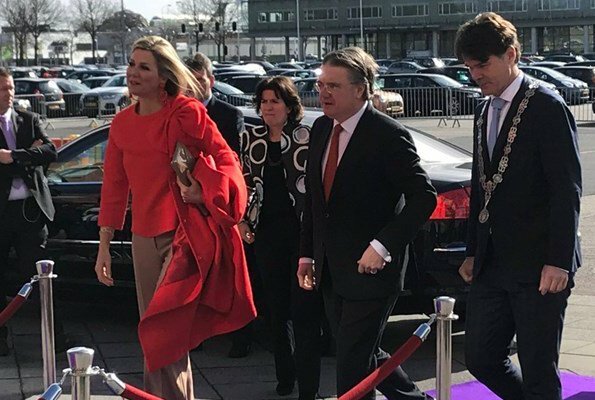 Maxima looks terrible and what she is wearing is terrible also. Seit einigen Jahren, eigentlich seit sie Königin ist, finde ich, ist die Luft bei Maxima ein bisschen raus. Okay, auch sie wird älter, aber das ist es nicht allein: diverse Erkrankungen und natürlich der Tod ihres Vaters und der Schwester setzen eins obendrauf. Sie sieht so oft einfach nur ausgelaugt aus. Wie heute auch. Und das spiegelt sich in ihrem Styling (Mode, Make-up, Haare) wider. 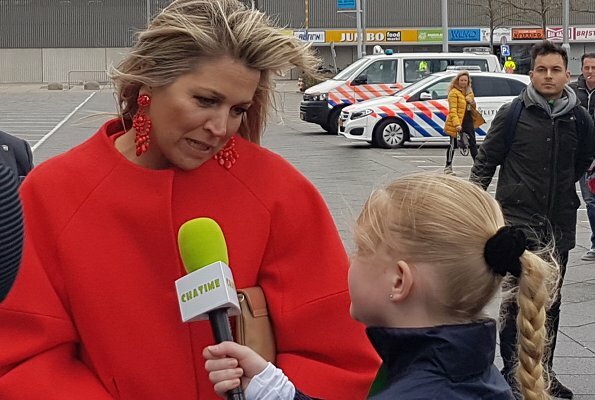 For me the earrings are two big as also the trousers and maybe also the coat! But I like the combination of colors and love the top, for me it's a very beautiful top. Oh, dear, not a good day for her. What I can see of her fashion is pants that are so baggy-draggy. She is tall enough to carry off nicely the roomy red-orange coat, but oh my, the sad hair. If the weather is wet and windy, why not tie it back with a nice bow? I’m afraid long, big, puddling trousers are the “in” fashion right now. Let’s hope this very ugly style passes quickly. Agree, just another bad day for her. She does need a real friend. Mal habillee, mal coiffee, rien de neuf. Nice to see the Queen again. Like the color of the top and coat,nice combo. Sadly to say the pant is too long.It must have been a windy day. 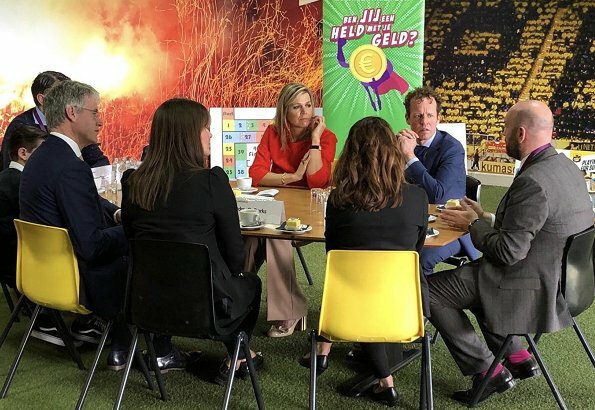 Die oorbellen moeten uit, niks mooi aan zoiets in je oren. I like the color combination. The problem is that Maxima wears so many "big" pieces. The pants are not bad at all if they looked like they do in the second picture. This style is meant to be worn that long. Her top has an interesting design, but it is a lot with the pants, especially paired with this style of coat. The last thing this outfit needed were the earrings. A simple and small gold earring would have worked much better. Her hair is another disaster on a windy day. I like the top, the earrings, the shoes, the colour combo but overall doesn't work for me. 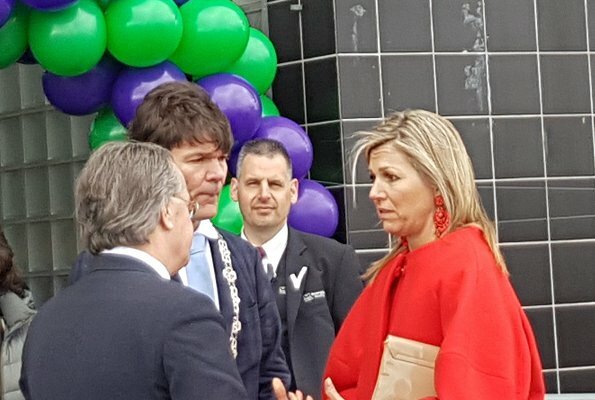 Even allowing for the fact that it is clearly a windy day, she must have stylists at her disposal who could fix something more manageable with her hair.